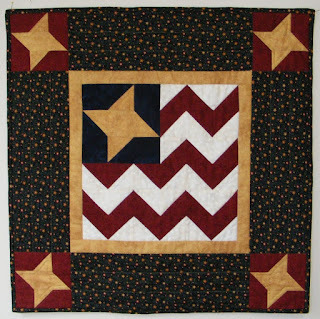 Quilting Adventures: Happy belated 4th of July.....! Happy belated 4th of July.....! I do hope you have all had a wonderful July 4th celebration! I really had every intention of writing a post for July 4th. But....... other things came in the way. You know, it's not like I have no quitly projects to tell you about.... I really cannot figure out why I don't seem to write post as often as I used too. Sigh! Well, for one thing, I keep forgetting to take a picture of the quilt tops I've completed. However, for this one, I especially made a trip back to the shop to take a picture. I just thought it was such a cute festive quilt. This is a pattern by Briarwood Cottage and is part of their monthly Pocket pattern series. They have the cutest little patterns to make! This one was done in less than a day! I think it took me longer to machine quilt it then to piece it! I ended up machine quilting in the ditch! Good to see a post from your way. I know how life can get in the way of blogging, but glad to hear your still working away on quilts. That is a cute pattern for July, but guess it could also be for Memorial Day, Flag Day and on and on. That is a really cute pattern! How is the shop doing??? I was thinking about you the other day and wondering if she is having fun and making lots of shop samples now? I know, we are all so very busy...but thank you for sharing your wonderful patriotic quilt...I love it! The quilt is cute! I am not surprised you don´t post as often as you did, you are BUSY, you have a shop to tend to. Nice quilt - its so fun to have special quilts for special occasions. I like your little flag quilt very much! Very cute flag quilt. Personally can't wait to see your Coney Island quilt.... i wonder why?